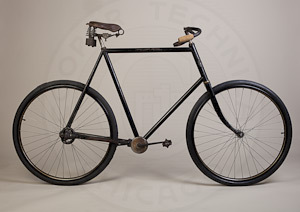 Hand-built bicycles reflect the same history as other fine hand-built mechanical goods. Bicycles reached a peak in the early post-WWII period when talented artisans turned their attention away from war production as resources were limited and cars were in short supply. By the mid-1950's the development of new production technologies, like investment cast lugs, nearly ended the era of these custom bicycles. Still, a reduced handful of builders survived and continued to develop new ideas and designs. The bicycles in David Cooper's personal collection were all custom built by talented artisans and restored by Cooper with period components. Each was chosen for its unique features, wonderful craftsmanship, or unusual design. A handful of them are un-restored and in original condition. By the mid-1890's over 1 million bicycles had been sold in the United States. Columbia, owned by Pope Manufacturing Company--one of the largest bicycle manufacturers in the U.S., built high-quality bicycles in Hartford, CT. Pope had purchased all of the patents from other manufacturers for adjustable bevel gear shaft-drive bicycles believing it to be superior to chain drive and designed his machines to incorporate all the best features of the others. 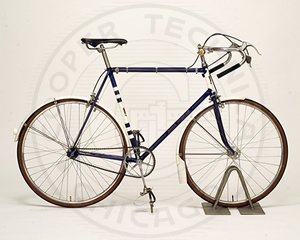 From 1898 through the 1920's, Columbia was known for their chainless line of bicycles. The Model 59, built in 1899, sold for $75 when new. 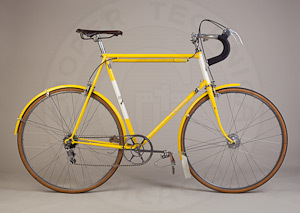 The Golden Sunbeam was considered the Rolls-Royce of British upright cycles. 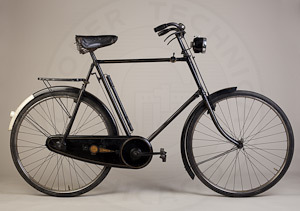 This particular bicycle, an unrestored example from 1935, was one of the last constructed. 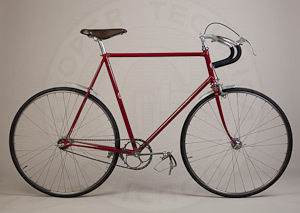 Bates, one of the most highly regarded London frame builders, was best known for the unique "Cantiflex" varying diameter frame tubing and "Diadrant" double curve front forks. There were two Bates brothers, originally partners, but after the war they split, forming two separate companies. 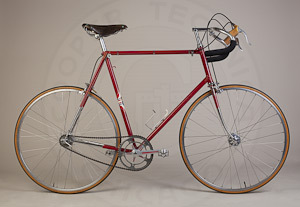 This frame was built by Bates of London in 1950. Rene Herse was one of the great French constructeurs, particularly known for his touring frames with integrated components. Herse, a former aircraft engineer, conceived of his bicycles as complete systems, rather than assemblies of unrelated parts. In the early years following WWII, Herse manufactured his own design components including cantilever brakes, handlebar stems, and forged alloy cranksets. A large frame, like this one, is very rare. R.O. 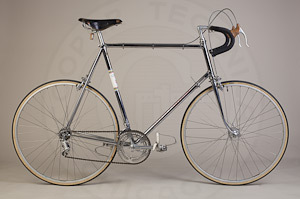 Harrison was a London builder of high-end lightweight bicycle frames. Their 1949 catalog describes the Madison as "A purely track model for grass, cement or steeply banked tracks and which has been used in many 6-day Races. 531 butted throughout with attractively cut lugs. Hobbs of Barbican built bicycles frames from 1933 until 1953, having a reputation for superb quality. 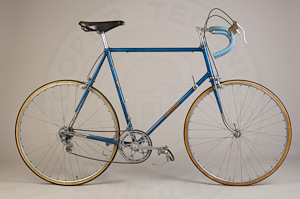 The Blue Riband model was their top-of-the-line post-war frame. This example, a road/path type, was built on 30 March 1951. Gillott was a high-end builder in England known for their quality workmanship and beautiful aesthetics. This is a road/path frame, built to be ridden to the track, raced, and then ridden home. Ephgrave was another of the master craftsmen building bicycles in the UK. He was particularly known for the precision of his frames and the high quality of his lug work. This frame, made in 1953, is a No. 1 model. Urago was a high quality French builder located in Nice specializing in racing frames. 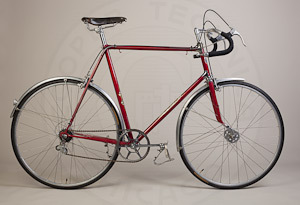 This bicycle is an example from 1958. 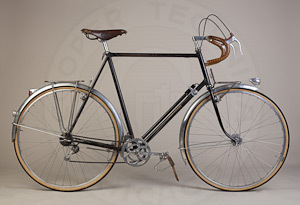 H. R. Morris was a highly skilled craftsman in England, personally building about 600 hand-built bicycles over the years. This particular frame was custom built in 1965 and has some unusual features. Hetchins was renowned among builders of lightweight cycles for their fancy lugged frames with Vibrant (Curly) stays. 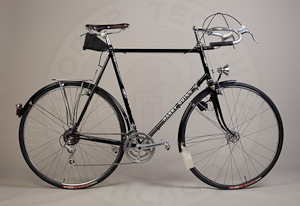 The Magnum Opus was the top of the Hetchins line, and has some of the most elaborate lug work of any bicycle. The cost, including components, in 1965 was considerable, GBP 95 14s 5d. 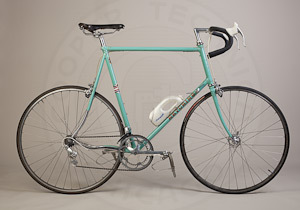 Cino Cinelli was one of the great Italian frame builders. 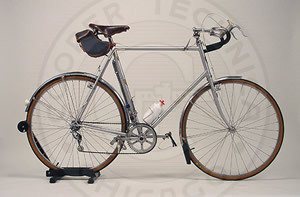 This bicycle, built in 1967, was a custom order in full chrome. It is unrestored and still has its original head badge and all components except the saddle. I bought it from the original owner. Hetchins introduced the Vade Mecum ("go with me") lug pattern in 1953. In 1964 they updated the design with three versions VM Mk I, II and III. 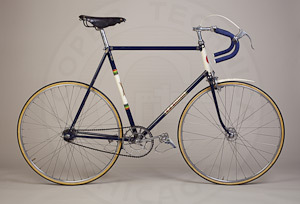 This track bicycle is an example of VM Mk I built in 1968. 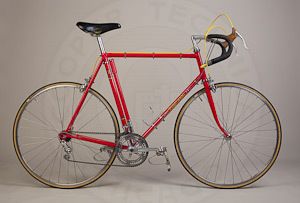 Sante Pogliaghi was one of the great Italian frame builders, specializing in road and track frames. The Schwinn Paramount was my dream bicycle in 1972. 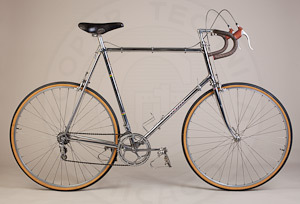 They were the finest American-made lightweight bicycle, built with Reynolds 531 tubing and Nervex orfor a whilePrugnat lugs. The all-chrome finish might have been slightly heavier, but it was totally cool, and different than anything else on the road. 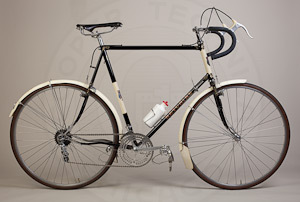 Many bicycle enthusiasts and collectors got their start with Paramounts. Harry Quinn was a high-quality builder in Liverpool. 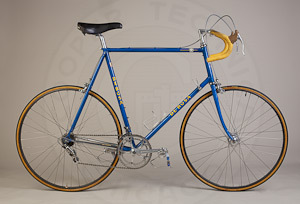 This touring frame, which I believe was made in 1974, uses Cinelli long point lugs and sloping fork crown. The chainstays are lengthened and the bike was built with relaxed touring geometry. Ugo DeRosa is another great Italian master frame builder. This bike is a 1987 Professional SLX model, in original un-restored condition. This was a custom order from Hetchins in 1994. The client sent sketches and a watercolor to show exactly what he wanted. When the frame came up for sale in 2002 I bought it and built it up with Campagnolo C Record components. In 1978, Cino Cinelli sold his company to the Columbo family, makers of Columbus tubing. The enthusiastic new owners continued production of Cinelli's main products, including alloy handlebars and stems, and bicycle frames but updated the company's logo. 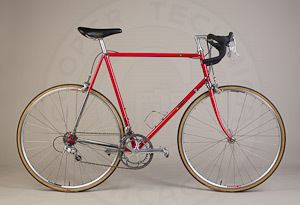 To this day, the company still makes the standard steel lugged Cinelli frameset, the Super Corsa.